Delegates to UE's 74th National Convention in August 2015 adopted a resolution on peace and justice for the peoples of Palestine and Israel, which has been unsuccessfully attacked by an Israeli law firm. The National Labor Relations Board (NLRB) has reaffirmed its dismissal an unfair labor practice charge brought by an Israeli law firm against a U.S. union, the United Electrical Workers, over its support of protests against Israeli policies including the union’s endorsement of the Boycott, Divestment and Sanctions movement (BDS) movement. At its national convention in Baltimore August 16-20, 2015, the United Electrical Radio and Machine Workers of America (UE) adopted a resolution endorsing the BDS movement to pressure Israel to negotiate peace with the Palestinians and end the occupation. UE is the first national U.S. union to endorse BDS. Read the resolution here. On October 23, the Israeli law firm Shurat Hadin filed a charge with the NLRB alleging that UE’s resolution violated the prohibition in U.S. labor law against “secondary boycotts.” The union disputed the charge, arguing that Shurat Hadin’s action was an attempt to interfere with the First Amendment rights of the union and its members to express opinions on political and international issues, and also that the Israeli firm’s allegation were factually untrue. On January 12, Region 6 of the NLRB dismissed the charge. Shurat HaDin then appealed to the Office of the General Counsel of the NLRB, and on May 26 that office denied the appeal. “UE opposes any legislation and legislative resolutions that outlaw or condemn legitimate criticism of Israel and support for BDS, or attempt to sanction individuals, organizations, companies or governments simply because they have legitimately criticized Israel or supported BDS. We will support legal and political challenges to overturn such attacks on fundamental civil liberties.” On July 14, peace activists defeated an anti-BDS bill in the Massachusetts legislature. 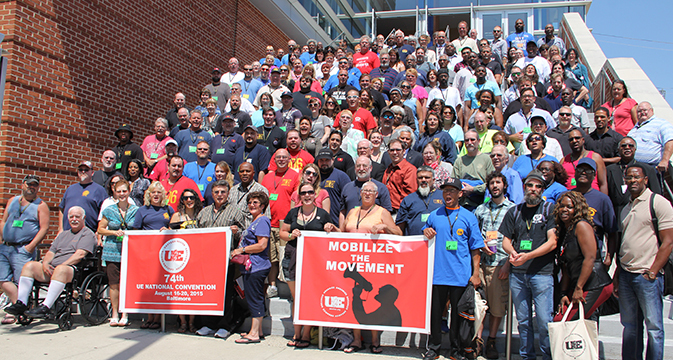 UE is an independent, member-run union, with headquarters in Pittsburgh, representing 30,000 workers across the country in the private and public sectors. At its five-day convention last August member delegates acted on 37 resolutions on collective bargaining, organizing, and political issues. Shurat Hadin is an Israeli organization that uses legal cases to harass supporters of Palestinian rights and critics of Israel, a strategy known as lawfare. Its most infamous case was a 2011 lawsuit against former President Jimmy Carter for writing a book critical of Israel, Palestine: Peace Not Apartheid. The suit against Carter failed, as did a suit aimed at censoring Al Jazeera’s reporting. Its attacks on UE began Sept. 2, 2015 when Shurat Hadin wrote a letter to the CEO of the General Electric Company, UE’s largest employer, “warning” GE to “rescind its recently concluded labor agreement” with UE because Shurat Hadin didn’t like the union’s resolution on Israel and Palestine. On July 11, 2016, Shurat HaDin sued Facebook for $1 billion, charging the social media company with insufficiently censoring Palestinians.